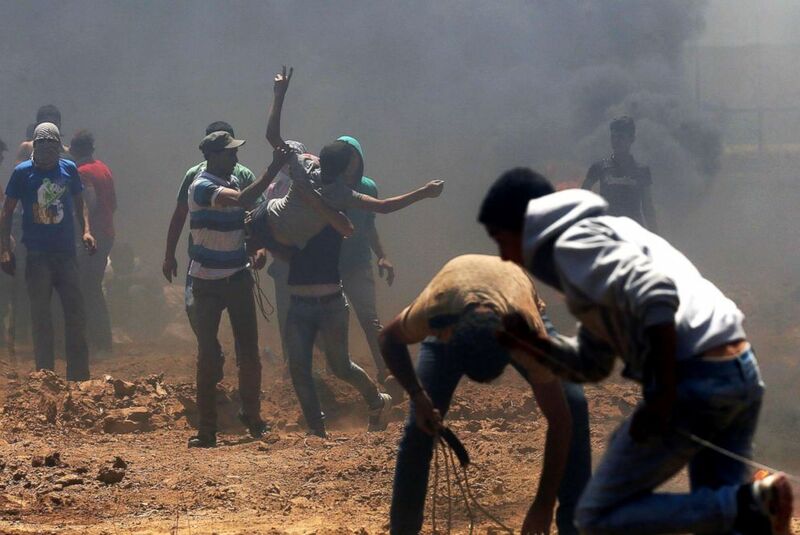 More than 50 people, including eight children, were killed by the Israeli military in Palestinian protests that erupted Monday along the Gaza border as the U.S. opened its new embassy in Jerusalem, Palestinian authorities said. 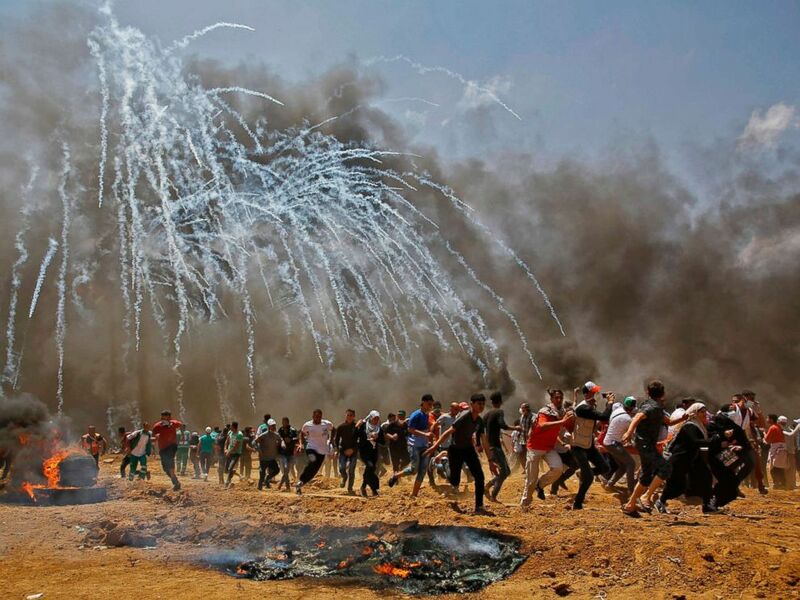 The deaths and injuries to over 2,400 people came mostly from gunfire by Israeli forces as Palestinians amassed at the border in far greater numbers than in other recent demonstrations. The crowds had swelled to tens of thousands by the time a U.S. ceremony to open its new embassy started about 50 miles away in the Arnona neighborhood of Jerusalem. 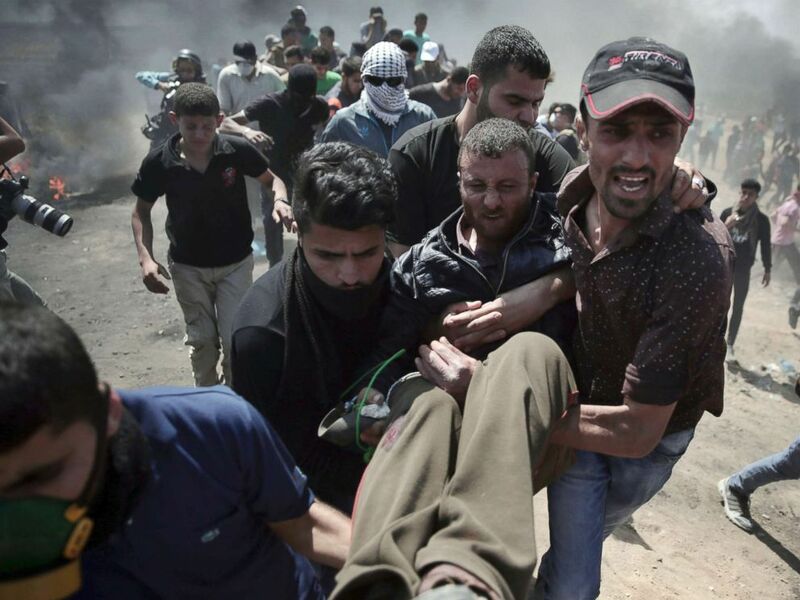 Palestinian men carry an injured protester during clashes with Israeli forces near the border between Israel and the Gaza strip, east of Jabalia, May 14, 2018. The Palestinian ambassador to the U.N. accused Israeli forces of using "massive firepower" against civilians. 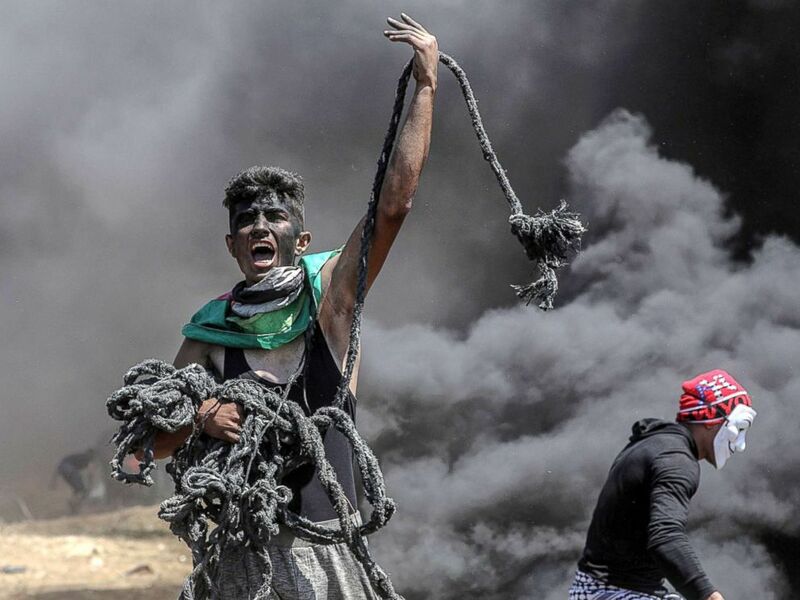 "We condemn in the strongest term the atrocity by the Israeli occupying forces using this massive firepower against civilians who have the right to demonstrate peacefully, and they have been demonstrating peacefully," Riyad Mansour, the Palestinian ambassador to the United Nations, told reporters outside the U.N. Security Council chambers in New York. "We condemn this action in the strongest possible terms," Mansour said. "We demand that this action be stopped immediately, and we want those responsible to be brought to justice from the Israeli side because this is not allowed under the provisions of international law." He said among the Palestinian civilians killed Monday were eight children under the age of 16. Mansour spoke just hours after the ceremony to inaugurate the relocated U.S. embassy concluded. 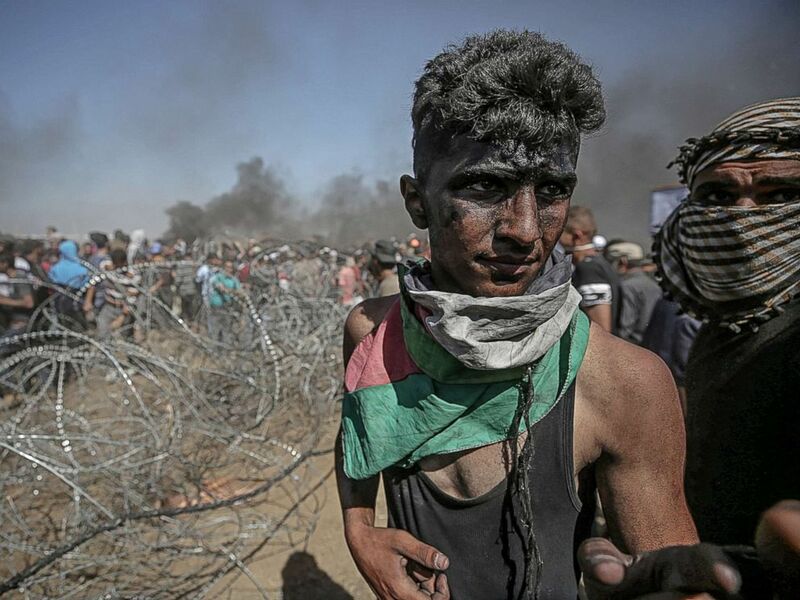 Palestinians protesters pull barbed wire fence installed by Israeli army along the border during clashes after protests near the border with Israel in the east of Gaza Strip, May 14, 2018. In a videotaped statement played at the ceremony, President Donald Trump said the move of the embassy from Tel Aviv has been "a long time coming." The president said the United States "remains fully committed to facilitating a lasting peace agreement" between Israelis and Palestinians. "We extend a hand in friendship to Israel, the Palestinians, and to all of their neighbors." "May there be peace," Trump said. "May God bless this embassy." The killings of Palestinian protesters made Monday the bloodiest in Gaza since the first Palestinian intifada in 1987, an uprising against the Israeli occupation of the West Bank and Gaza. "What was opened today in Jerusalem is not the U.S. embassy but an Israeli settlers' post," Palestinian President Mahmoud Abbas said. "The number of Palestinian deaths will go up. It was a barbaric massacre in Gaza today." Palestinian demonstrators run for cover from Israeli fire and tear gas during a protest against U.S. embassy move to Jerusalem at the Israel-Gaza border in the southern Gaza Strip May 14, 2018. He said the move of the U.S. Embassy in Jerusalem means the United States should no longer try to serve as an intermediary in the Middle East peace process. "The U.S. is not a mediator anymore," Abbas said. Mansour at the U.N. echoed this view, saying there is "no chance" that Palestinians will engage in a U.S.-led peace process. Protesters began amassing at the Gaza border ahead of the embassy ceremony. Mansour cited the macabre juxtaposition of smiling faces at the embassy ceremony and a scene of anger, terror and death at the Gaza border. "It is very, very tragic that they're celebrating an illegal action while Israel is killing and injuring thousands of Palestinian civilians," Mansour said. "This is the life of the Palestinian people, and those who think that opening the embassy opens doors to peace, let them look at what is really happening in the Gaza Strip." A 21-year-old and a 29-year-old were among the first killed by Israeli soldiers, according to the Gaza Health Ministry. 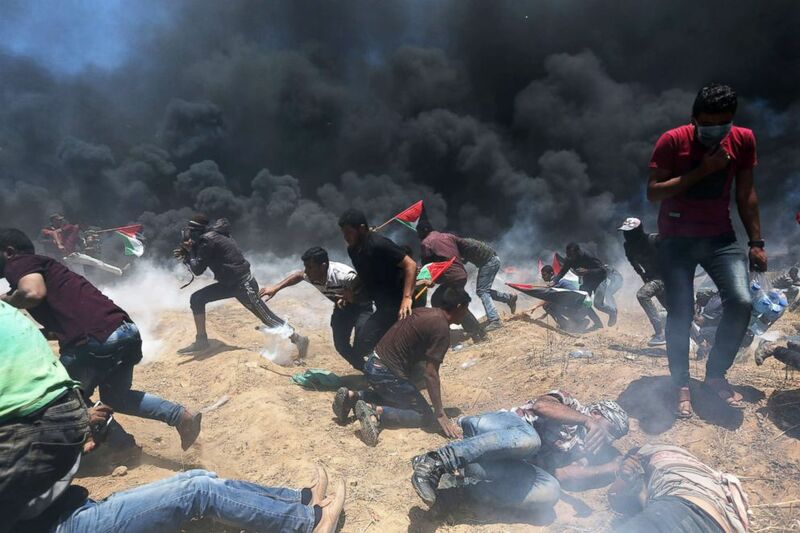 Since March 30, nearly 100 Palestinians have been killed and more than 11,000 injured in protests along the Gaza border, according to Mansour. 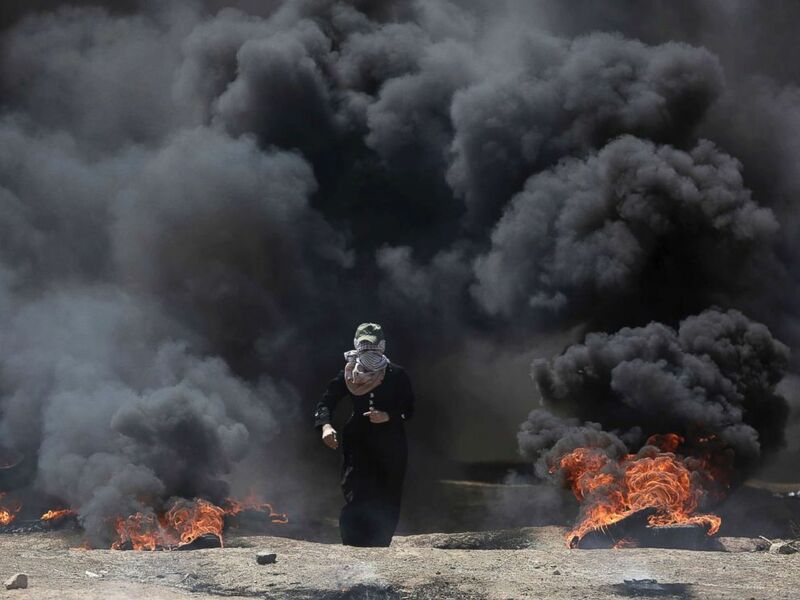 A Palestinian woman walks through black smoke from burning tires during a protest on the Gaza Strip's border with Israel, May 14, 2018. "Shame on those who ignore the pain and the suffering of the Palestinian people," Mansour said, adding that he is considering asking for an emergency U.N. Security Council meeting. Kuwait took that step Monday, requesting an opening meeting of the Security Council on Tuesday morning to discuss what a spokesman for Kuwait's U.N. mission called "the situation in the Middle East, including the Palestinian question, in light of the developments on the ground and the killing of innocent civilians." Trump announced in December that the U.S. would move its embassy to Jerusalem, which he said is Israel's capital. His decision set off protests by Palestinians who see East Jerusalem as the capital of their future state. Both Israelis and Palestinians consider Jerusalem the holiest site of their respective religions. The opening of the new embassy in Jerusalem coincides with the 70th anniversary of the establishment of the state of Israel. For Palestinians, Tuesday marks the anniversary of "naqba," or catastrophe, when hundreds of thousands of people fled or were forced from their homes during the war surrounding Israel's founding. Palestinians run for cover from tear gas during clashes with Israeli security forces near the border between Israel and the Gaza Strip, east of Jabalia, May 14, 2018. Trump did not make the trip for the official opening, but sent daughter and adviser Ivanka Trump and son-in-law Jared Kushner in his place. Treasury Secretary Steve Mnuchin also made the trip. "I am so proud to be here today in Jerusalem, the eternal heart of the Jewish people," Kushner told those gathered at the ceremony. He said Trump made good on his promise. "While presidents before him have backed down from their pledge to move the American embassy, once in office this president delivered. Because when President Trump makes a promise, he keeps it," Kushner said. 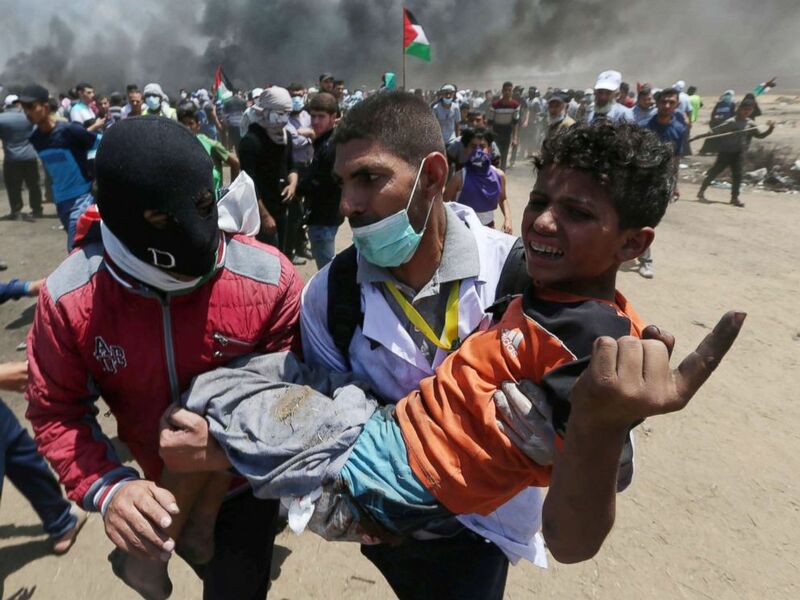 A wounded Palestinian boy is evacuated during a protest against U.S. embassy move to Jerusalem at the Israel-Gaza border in the southern Gaza Strip, May 14, 2018. Israeli Prime Minister Benjamin Netanyahu described the opening of the U.S. Embassy as "a day that will be engraved in our national memory for generations." "This is a great day. A great day for Jerusalem. A great day for the state of Israel," Netanyahu said at the dedication ceremony. He thanked Trump for "having the courage" to keep his pledge to move the U.S. diplomatic headquarters in Israel to Jerusalem, which Netanyahu called the "eternal, undivided capital of Israel." ABC News' Mark Osborne also contributed to this report.